Monday, December 14, 2009. This is a date that has been circled on my calendar for the past 8 months – the first day of training for this year’s Boston Marathon. 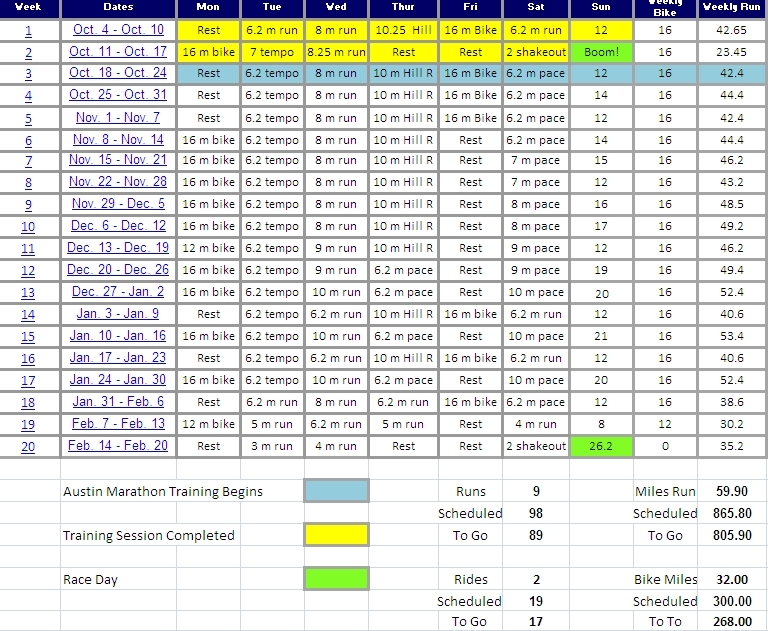 I have had a lot of success following a training schedule for races that comes from Hal Higdon’s Marathon Training Guide. Weekly mileage that builds over the course of 18-weeks that includes two “easy” run days, two “medium” run days and a long run on Sundays that vary from 8 -10 miles every third week to a long run of 20 miles three times prior to race day in weeks 12, 14 and 16. I’ve learned quite a bit since taking up mararthoning back in 2006 – when to listen to your body, when you can push pace and frequency in your workouts, nutrition, clothing, shoes, hill-work, strength training and now it appears that we are going to be learning a new lesson this week – how to recover from injury while training for a race. Team Run for Dom will be spending Monday morning at Austin Sports Medicine having an MRI done on our lower right leg injury that we have been unable to shake over the past several weeks. What began as a mild calf strain has now become an issue – that has taken up residence on the inner left tibia about one-third of the way up from the ankle to the knee. I’ve learned a lot about stress reactions and stress fractures unfortunately over the past week – luckily an x-ray on Friday was negative – however according to Dr. Fernandez at Austin Sports Medicine – the MRI tomorrow (Monday 12/14) will tell the true story and we can then work on a recovery plan. Stress reactions and stress fractures form due weakened muscles that surround the tibia. In their weakened state they can no longer absorb the pressure/pounding from repeated movements (in this case running) and transfer that pressure/pounding to the adjacent bone. I typically stride about 200 times per minute – which translates to approximately 1,400 strides per mile. On a mid-week training run of 6 miles I typically stride 8,400 times at 7:00 min./mile pace. Studies have shown that every 10 pounds carried by a runner creates 45 pounds of pressure on the knees, ankles, hips and back. For me at a race weight of 136 pounds that computes to slightly more than 612 pounds of pressure. If anything is out of alignment or a part of the runner’s musculature is compensating for a weakened area – injuries can and will occur. In my case a calf strain that I experienced hill-training in Pennsylvania has led to my lower leg injury in Texas. So what’s next? First and foremost I feel like I am in good hands here in Austin. Pictured to the left is one of Austin Sports Medicine’s other clients – some of you may recognize the 7-time Tour de France winner Lance Armstrong. We’re tight as we follow each other on Twitter …. actually I do keep up with Lance that way, as you can imagine he serves as a great example and inspiration to me in the Run for Dom effort. Lance did have his broken collarbone addressed at ASM prior to this year’s tour – so I know that I will be getting top-notch attention. The three possibilities at this point are shin-splints, stress reaction and a stress fracture. All of which are injuries that will heal with rest and rehabilitation and of course time. The time part is what we may be running out of. Keeping my current fitness level is going to be a challenge over this period as a worst case scenario stress fracture would require 6-8 weeks to heal leaving precious little time left to get my mileage to a position where we can compete at Boston. If we are on the 2-3 week-end of the scale with shin-splint recovery we may not be setting any PR’s at Boston – but we will certainly be in Hopkinton, MA come April 19th. So for now – we wait. In a cruel twist of fate December 14, 2009 has indeed turned out to be the biggest day of the year for me with respect to the 2010 Boston Marathon – just for an entirely different reason. If you have a moment around 10:00 am CST on Monday – please wish me luck and send me some positive energy. I get asked a lot about any “fears” I have related to marathoning, not being prepared, not finishing – I have always been truthful in answering “No, not at all”. Well, first time for everything I guess. On the bright side it looks like I’ll be learning a lot about a new sport – cycling – this winter if I am on the shelf from running for any extended period of time. Maybe Lance and his buddies will be able to give me a few pointers.